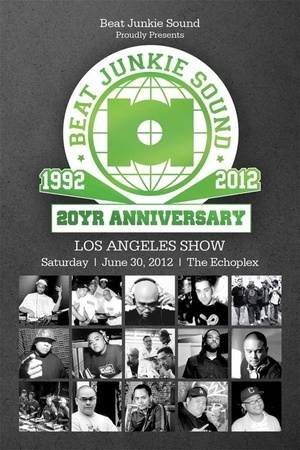 If you live in LA and know a thing or two about mobile DJ’s and turntablism, then you should know that the World Famous Beat Junkies will be on tour celebrating 20 years as a crew, starting with a show at the Echoplex on 06/30/2012. 20 years! And I’ve been listening to them on the radio since the 1990’s! Crazy! This is a one time event for LA so check them out. Tickets are sold out, but there might be limited admission at the door so try to arrive early. If you can’t make that event, then try to come out to Amoeba in Hollywood on Friday, 06/29/2012, to see them perform before their tour kicks off that Saturday.